Samu Manoa says sun, sea and sand were his main motivations for a move to Toulon. 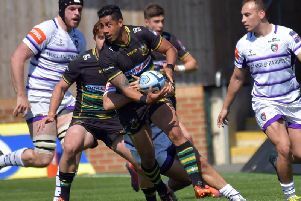 The current Saints supporters’ player of the year has agreed to make the switch to the cash-rich French club when his Northampton contract ends next summer. Toulon president Mourad Boudjellal has tipped Manoa to become one of the stars of the Top 14, labelling him a ‘rugby phenomenon’. And the American forward, who has become vital to Saints since joining from San Francisco Golden Gate in 2011, is relishing the new challenge - and environment. “Yeah, I’m off next season,” Manoa confirmed. “It’s a new challenge, something new for my family. “I know it’s going to be hard but you’ve just got to get on with it and see what happens. “First of all it (the reason for the move) was the sun, the beach. There were a couple of other clubs, but I can’t turn down the sun and the beach. “They’ve got world class players in their squad and I want to see if I can play well with those guys.